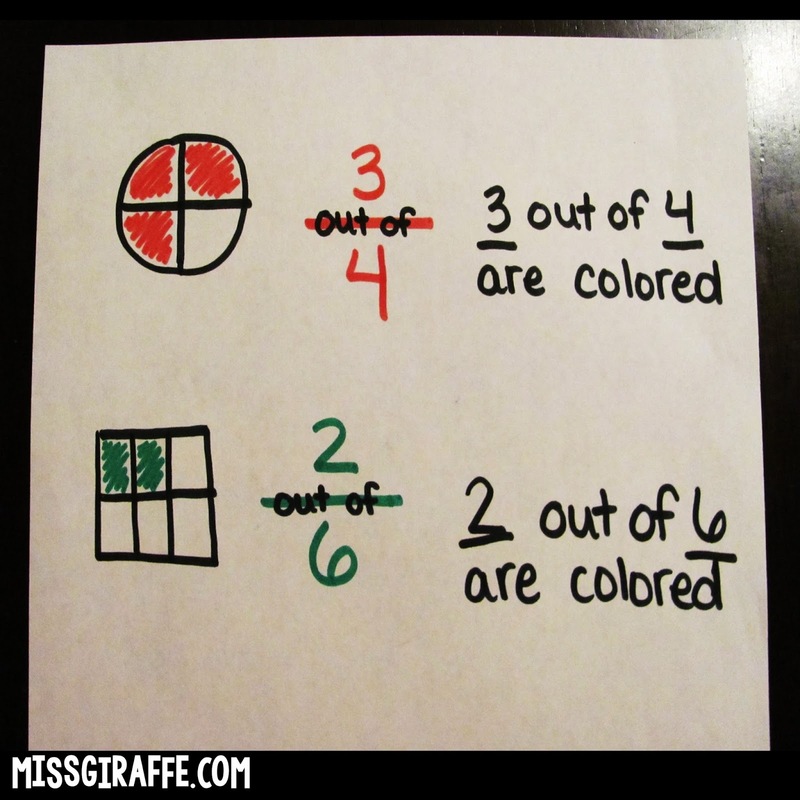 I know I seem to say this about every math concept I blog about but I LOVE FRACTIONS. It's weird to even hear myself say it because I struggled, and I mean struggled, with fractions in school. I was a good test taker though so I always flew under the radar with my teachers but I remember just looking at them like What is this?! 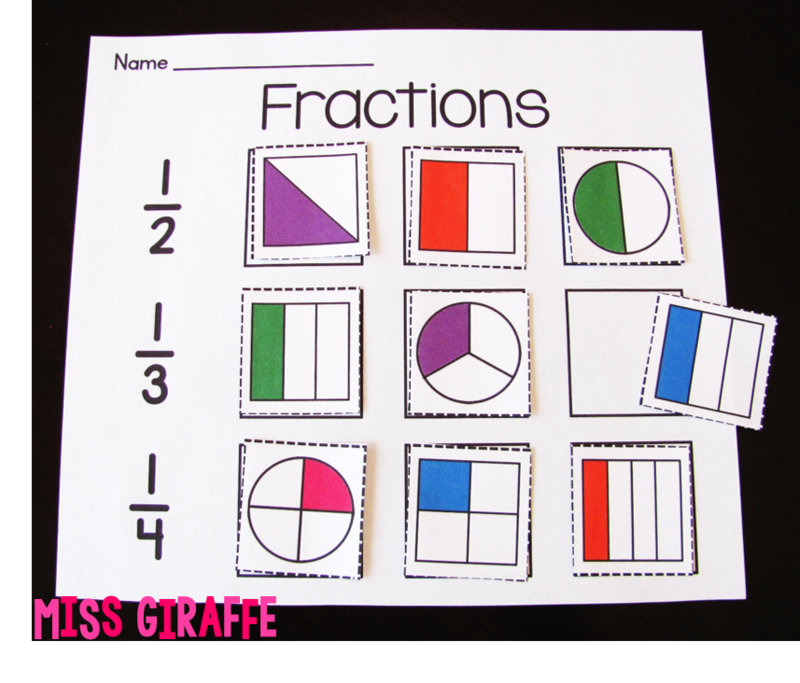 SO I think it is really important to build those fraction foundations so your students don't end up staring at fractions the way I did! 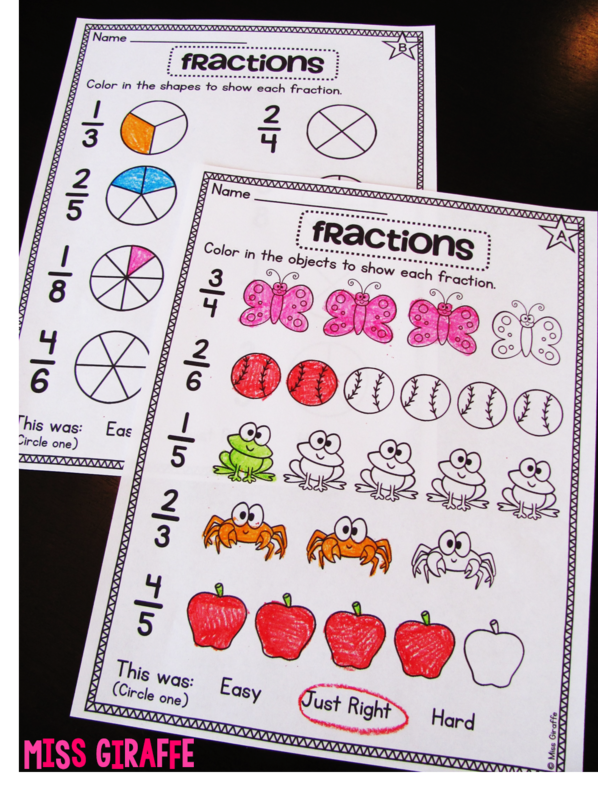 I think the first concept in fractions to teach is EQUAL PARTS, or EQUAL SHARES. See those funky shapes with unequal parts on the right?? We call those "nutty shapes"! 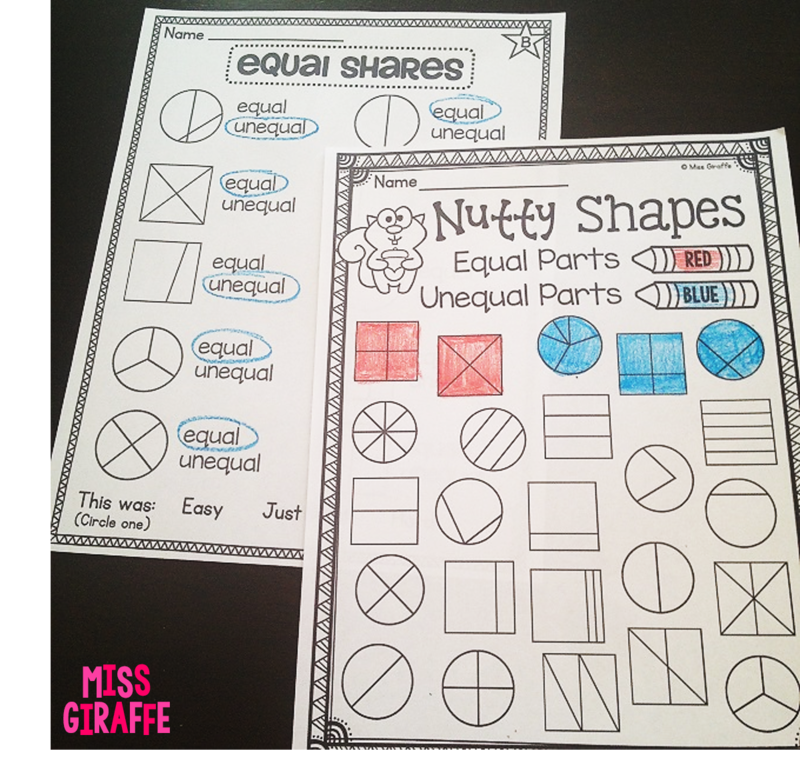 Our job is to help our squirrel friend find the nutty shapes with unequal parts so we sorted the shapes by whether they had equal parts or unequal parts. 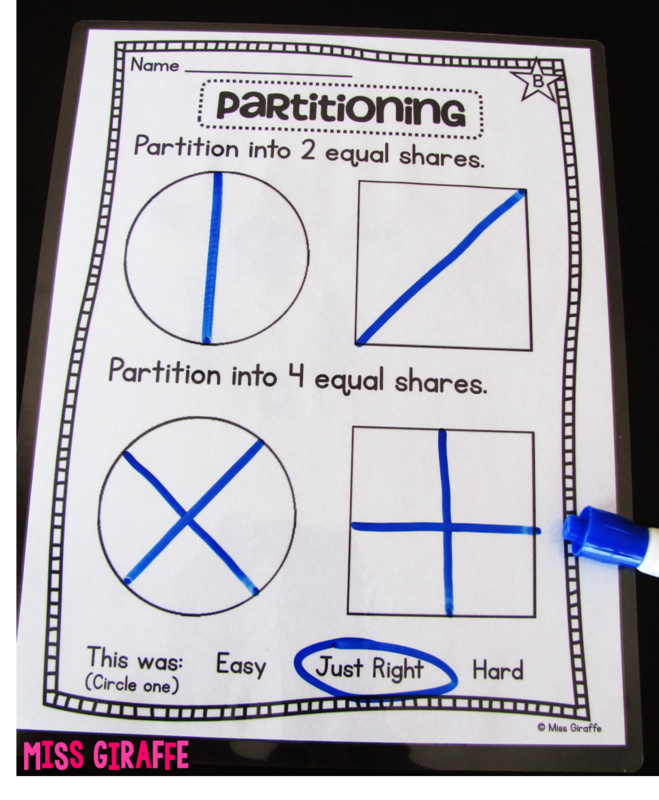 Once your students understand that fractions have equal parts, I recommend having them partition fractions themselves! The most fun way to do this, in my opinion, is with dough! 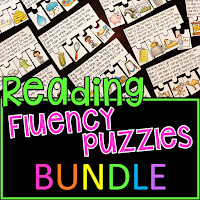 This activity is not only super fun but it promotes SO much good conversation and thinking. Guide your students by having them cut one of their circles in half. Talk about how each of the 2 shares is a half and together they're called halves. Then have them cut their other circle into half.. and then half again. Let them know these are called fourths because there are four equal parts. As they're looking at their halves and fourths side by side, ask them if they notice anything. Discuss how the more shares you cut it into, the smaller the shares get. You could also cut your circle in an unequal way and ask if it's cut into halves/fourths/whatever and help them see that the shares must be equal to be called halves/fourths/etc. 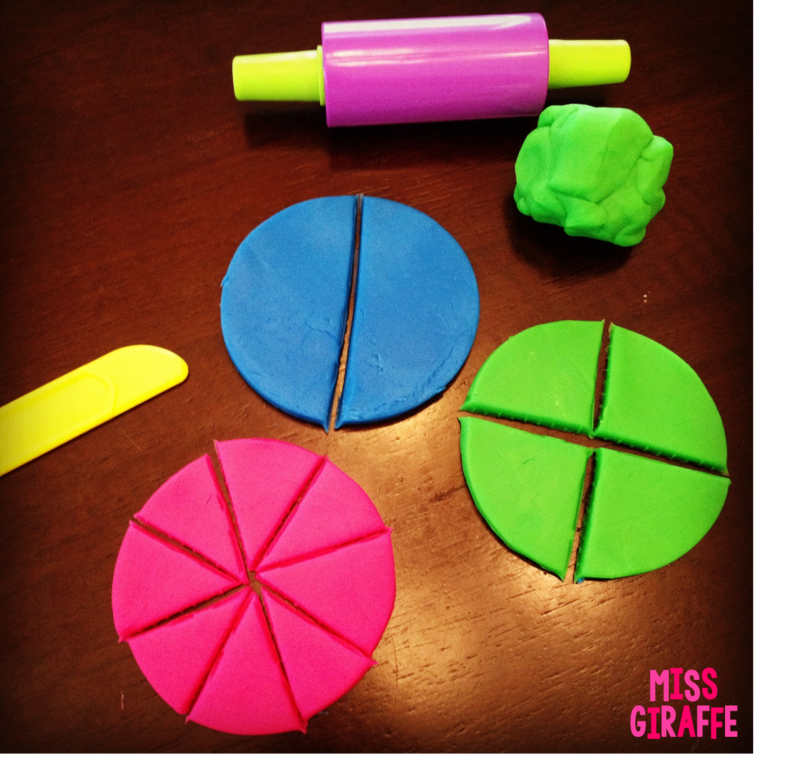 There are so many great concepts you can teach with the dough out! I also made a cute little recording sheet to go along with it so they can write about what they learned during/after their exploration. For more halves, fourths, etc. practice, I made practice sheets in different difficulty levels. 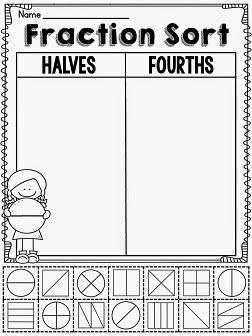 One of the types of worksheets I made were these sheets that focus on a specific type of fraction (cut into halves, thirds, fourths, or eighths). 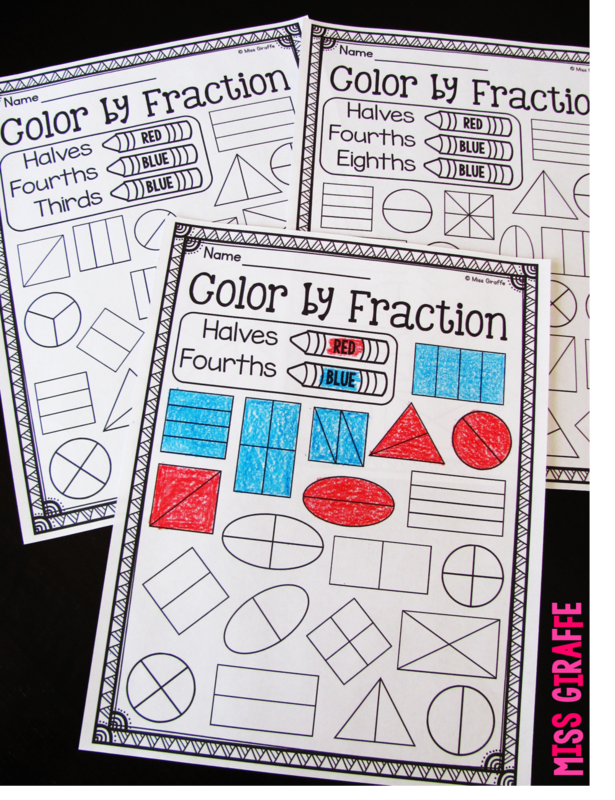 I love these because they practice several skills at once but for each type of fraction so it's not too confusing or overwhelming. And of course some cutting and pasting action because I love having them for every math concept ever because kids love it and it is great, self-checking practice. Math Worksheet + Cutting/Gluing = Party. and a little coloring action too because who doesn't love coloring?! 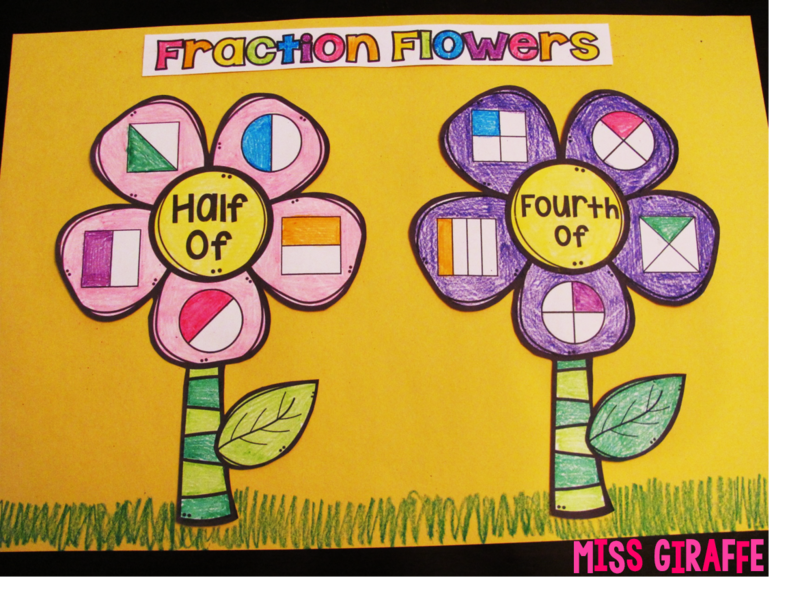 Once you think they've got it down, I recommend busting out the Fraction Flowers!! I included this activity in a bunch of different ways because I love it so much. 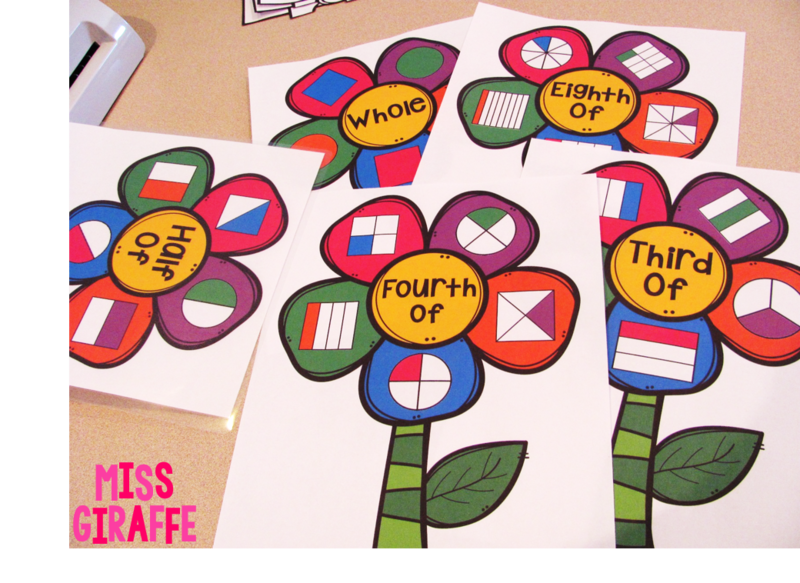 You can use it as a craft, a math puzzle/center, or hang the flowers up as a poster or visual aid. The craft makes a super duper cute bulletin board! I love the way ours turned out! Sorry for the #notsohumblebrag but I can't help it - I love, love them and they were a lot of fun to make! For this math craft, we sorted the HALF OF fractions and FOURTH OF fractions. I also include WHOLE, THIRD OF, and EIGHTH OF. 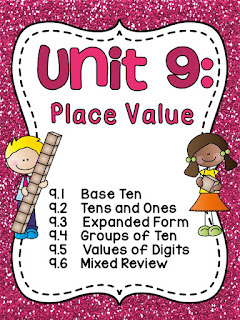 It's differentiated as well so you can choose how much to challenge your students. Each flower comes in both full color and black & white. 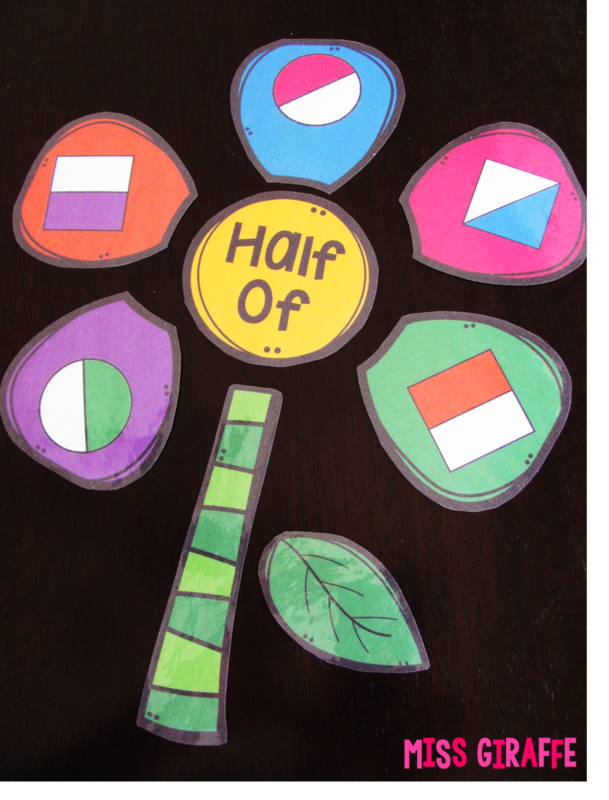 Each of those options also comes in pre-made (where the flower is already put together as a pretty flower like you see above) OR mixed up in pieces for students to sort and build their own flowers. 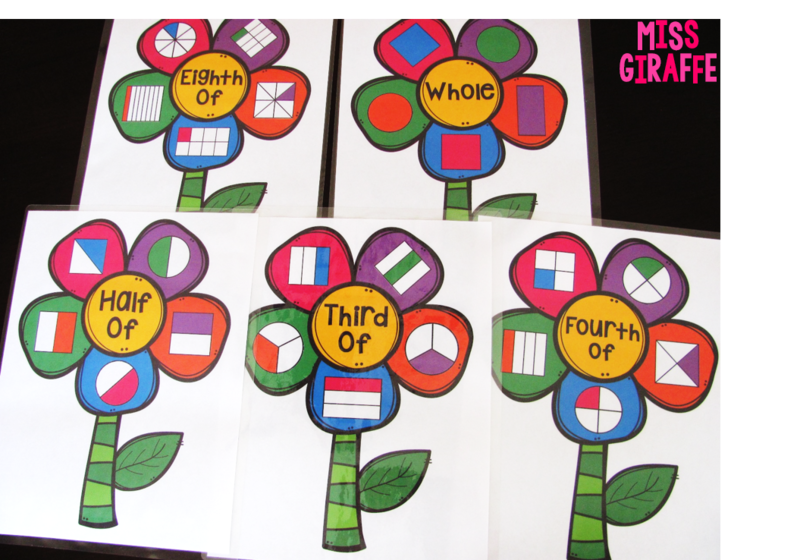 For the craft, I just printed the premade black and white flowers so all you had to do is color in the fraction either half of or fourth of, color the rest of your flower, and then cut and glue it to the construction paper. The mixed up pieces color version is a review center for next week! 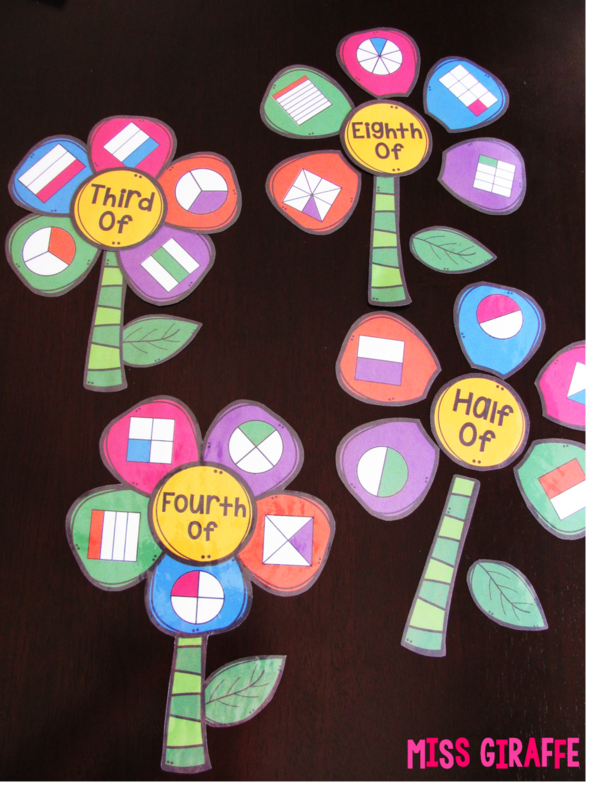 Students sort the petals to the right fraction and then copy what they match onto their recording sheet. For the premade color ones, I printed and laminated them to use as a visual. Right now, they're on my table as a reference tool but I'm going to cut them out and hang them up as a classroom poster display soon. Being able to partition the fractions into halves and fourths themselves is a big concept in first grade so that's important to practice! 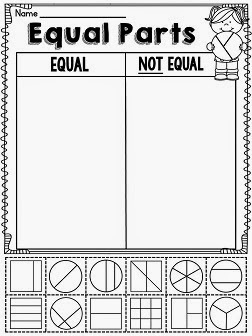 I made worksheets to practice but this one (the easy level - A) is good to throw in a pocket protector with dry erase markers to practice in small groups when introducing it. 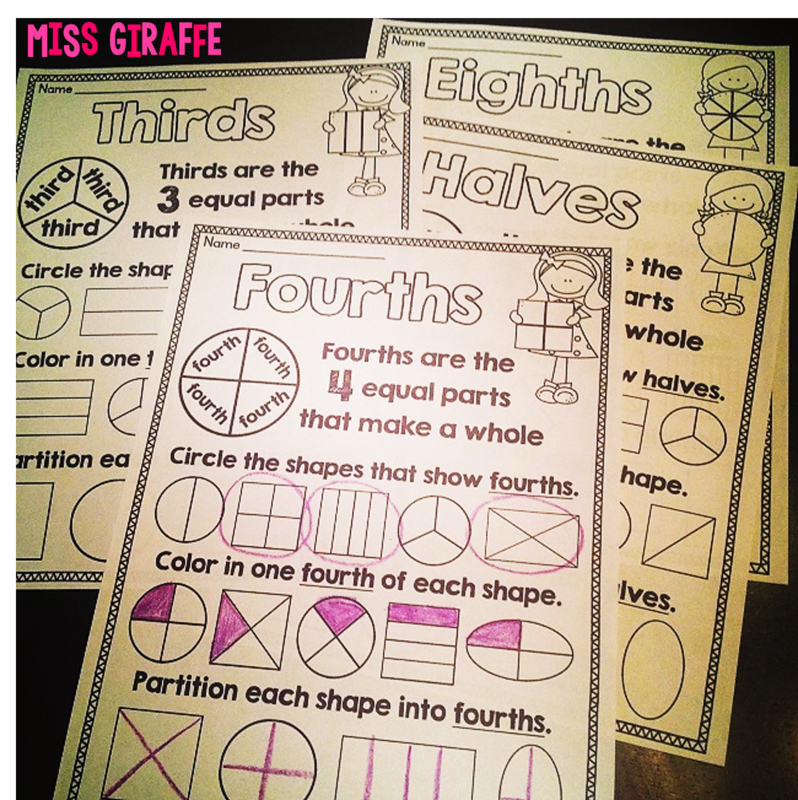 Encourage your kiddos to find multiple ways to divide the circle/square into halves/fourths/thirds/whatever. 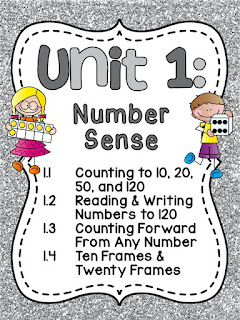 Once you feel like they really get the fundamental concepts, you can move into the number representation of fractions. I know a lot of first grade teachers are told not to do it but I personally think that once you lay down the basics, they're very capable. If you're saying "1 out of 3" shares, they might as well know the representation. BUT if you disagree, that's fine! I created some very simple straightforward worksheets and centers to practice it for those who want to venture into the fraction abyss. 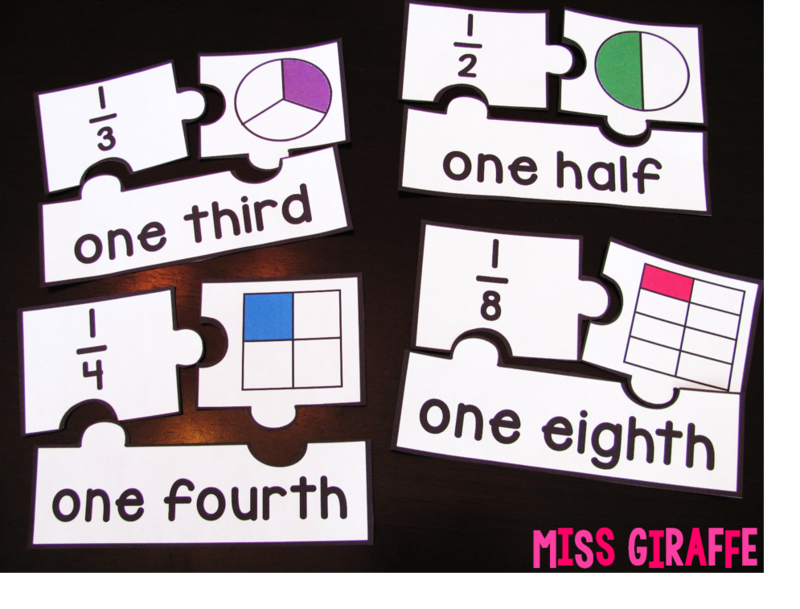 Thank you for listening to me share some of my ideas for teaching fractions. I hope you got some new ideas! 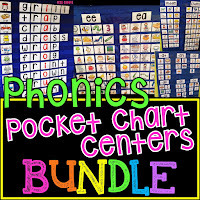 along with A LOT more worksheets, centers, cutting and pasting activities, and assessments! 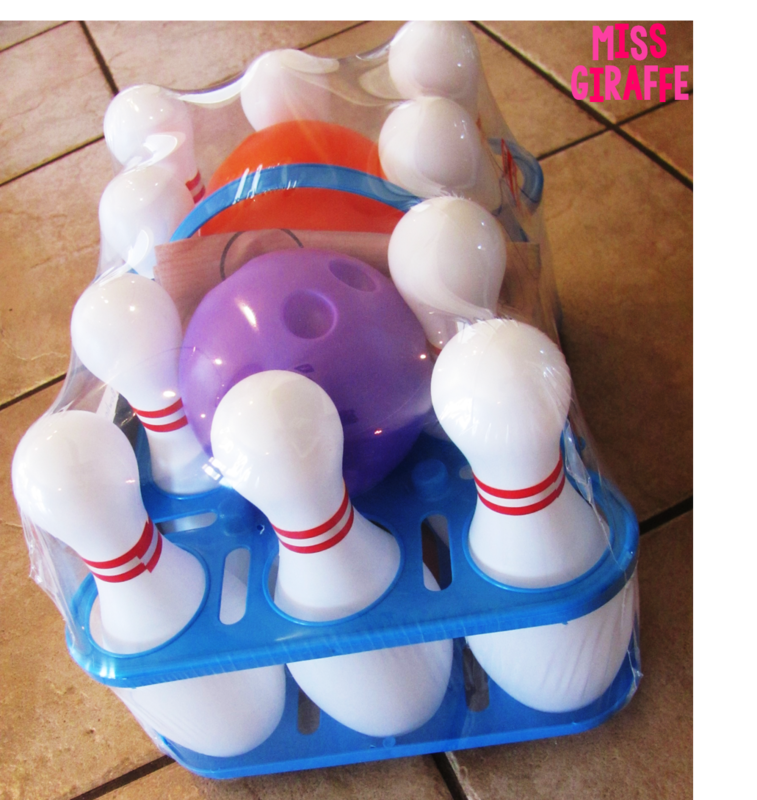 I scored this adorable little bowling set at Target for only $7 over the weekend and I'm so excited to use it. You can find 10-piece bowling sets in a lot of places so if you can't find this at Target, I'm sure you can find one online pretty easily. It comes with 10 plastic bowling pins and 2 little plastic balls. 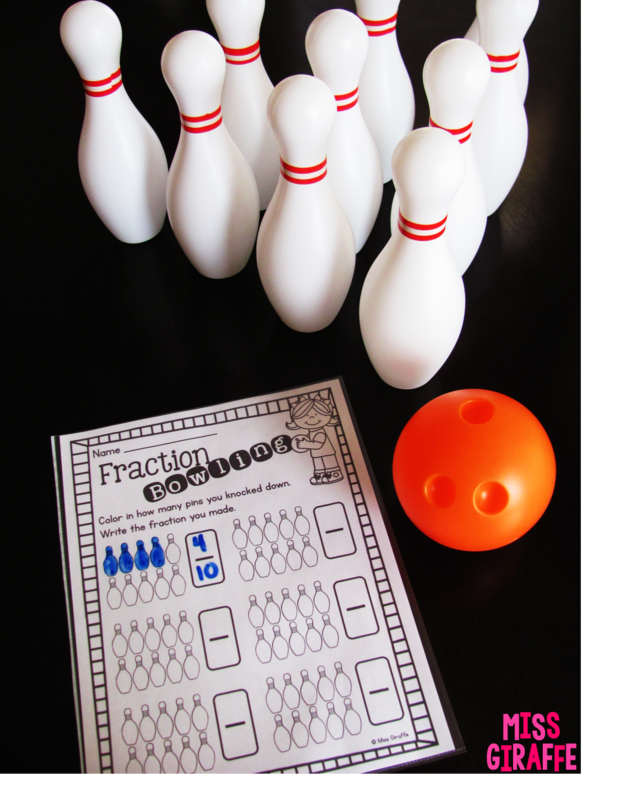 Have students take turns rolling the ball to the pins to try and knock them down. I recommend letting them roll it twice just like with regular bowling so they don't completely miss on their turn and get upset. There are 2 balls.. an orange ball and a purple ball so they could get both balls to start and roll each. At the end of their turn, they go to their recording sheet and color in how many pins they knocked down out of the 10 pins on the worksheet. Then, they write the fraction they made. So if they knocked down 4 pins, they'd color in 4 of the pins on their recording sheet and write 4/10 next to it. You can skip the writing the fraction part if your kids aren't ready for it. Just the 4 out of 10 is great practice anyway! Or if you want to make it harder for your super high kids, make them make a fraction of ALL the pins once they're all done (ex: 36/60 pins total). Again, thanks so much for taking the time to read my little blog! 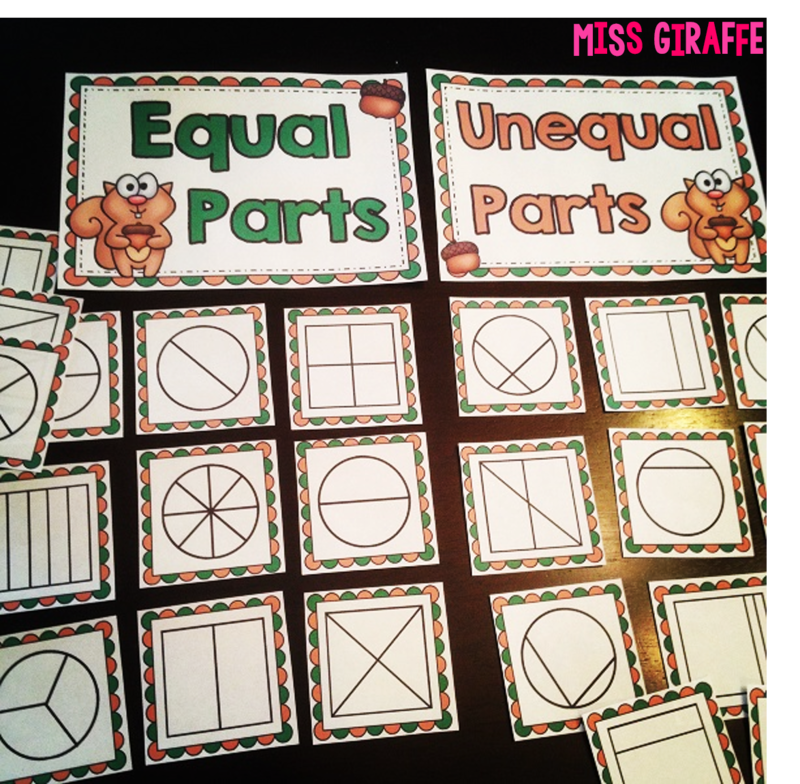 I teach 3rd grade and I found that my lower students were still missing quite a few of these skills such as partitioning, unequal parts and fractions as a set. I absolutely love the bowling activity. 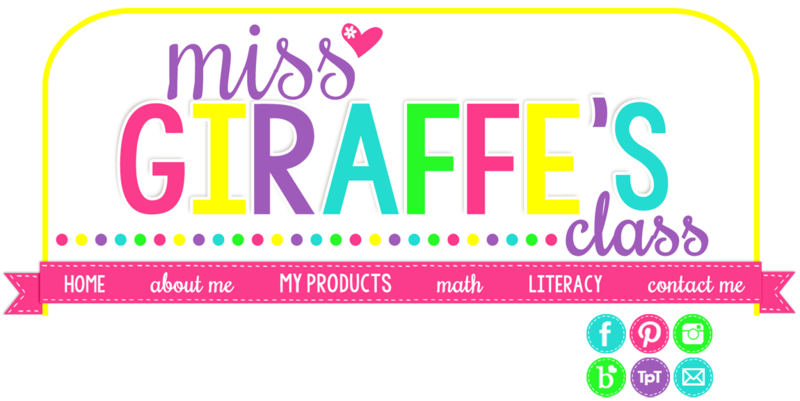 I will definitely have to do something similar with my 3rd graders. Fractions is such a major unit for us. 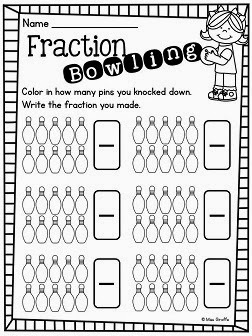 I absolutely love the fraction bowling! 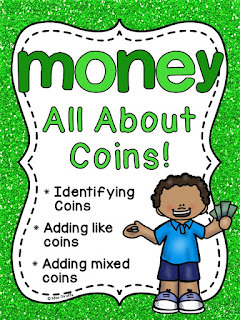 What a great way to keep your students engaged while reinforcing an important skill! love these ideas. will have fun teaching.